Take 42% off the entire book. Just enter code slhillard into the discount code box at checkout at manning.com. Professional developers know the many benefits of writing application code that’s clean, well-organized, and easy to maintain. By learning and following established patterns and best practices, you can take your code and your career to a new level. 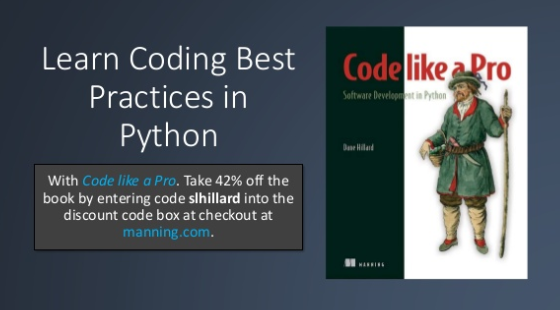 With Code Like a Pro: Software Development in Python, you’ll learn to design professional-level, clean, easily-maintainable software at scale using the incredibly popular programming language, Python. 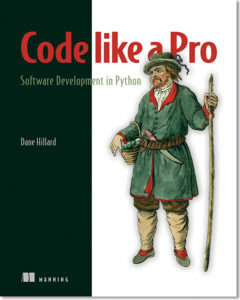 You’ll find easy-to-grok examples that use psuedocode and Python to introduce software development best practices, along with dozens of instantly-useful techniques that will help you code like a pro.